sometimes known as Gallahan (because it is situated on the east edge of the Gallahan farm). This long-abandoned little cemetery is north side of an east & west road known as the Gallahan road. It is about 36 ft. west of the S.E. corner of the S.E. 1/4 of the S.E. 1/4 of the fractional Sec.9, T27N, R3E of the 2nd Ind. P.M. in MIAMI Township , in CASS County , INDIANA . Cemetery is on the extreme Eastern edge of Cass County & it is in this section that the Eel River is crossed by the Hoovers [aka, Dean] bridge. The William Conner cemetery should not be confused with the John [or Jack] Conner Cemetery which lies 1 1/4 mile north of it. Fred Innsford of Hoovers (a descendent of Jack Hoovers) says that William & Jack were related though he doesn’t know how. 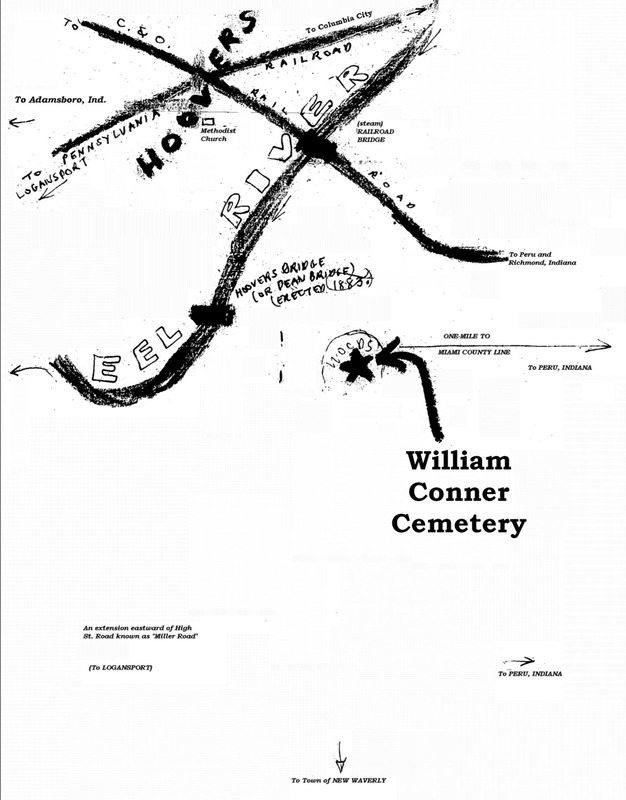 The William Conner cemetery is on the north side of the unpaved road which separates section.9 from section 16. In the late summer of 1922 when Lee Hitch & Sons of Macy , IN began the construction on this east-to-west road under the Supervision of J. Edward Gallahan, the workers accidentally un-earthed the remains of 2 or 3 unmarked graves on the north side of this road. Work was halted; and about a 9 ft. cement retaining wall was erected for a distance of about 22 ft. on the north side of the road at this point, with two extensions about 8 ft. northward to prevent any further cave-ins of marked or unmarked graves in this little cemetery which at this point lies about 9 ft. above the level of the road. As of the writing of this [Sept., 15, 1940], a large pine tree marks this cemetery & only 3 small slabs are found though it’s believed that perhaps a dozen persons were buried here. The north end of the cemetery is marked by the ruins of an old rail-fence which is probably the fence recorded by the late local historian, Dr. J.Z. Powell as being re-built in 1900 by a son of William Conner who had come here from the far west to re-visit the burial location of his parents. Cutting directly across the little cemetery from west to east and separating the Phebe Conner slab from the other two slabs is a modern-wire fence which separates the Gallahan farm from the right-of-way of the county-highway upon which this cemetery slightly encroaches. R.B.Whitsett Jr., Secretary of the L’A.V.M.A. Conner William ca. 1781 6/15/1836 Aged 55 yrs. Additional unmarked graves were found a few feet east of the marked graves in 1922 but the remains have never been identified & they are lost to us. The Conner’s buried here are thought to be related to those who live across the Eel River and north of here in Adam’s Twp., Cass Co., IN & descendents of the Connersville and Noblesville , Indiana Conner’s. William Conner may have been the first person in this area to begin an orchard.